Our Fine Art Tutor, Kate Palmer, and Wood Workshop Technician, David MacDiarmid, are collaborating in a new exhibition of their work. Collapse, showing at ARTHOUSE1 in South East London, opens today with a private view and runs until 24 march. On 11 March, Kate and David will be in conversation with guest speakers Lydia Prior and Martin O’Brien and the session chaired by Reece Jones. 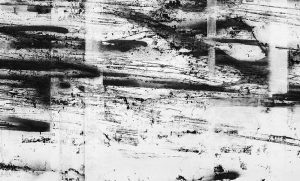 Both their work explores the void – the gap between marks or forms, fractures and collapse. By delving into formlessness or loss of material integrity of line and fabric, they have an identifiable purpose; to view the broken as a whole and to understand disconnection as part of a wider aim. 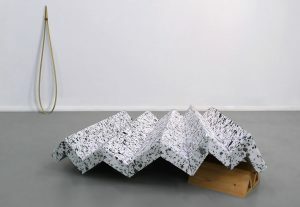 They use material processes to form temporary images, structures, or objects. What once existed has collapsed, and what has taken its place is also potentially impermanent. We are very proud of their achievements and wish them every success! David MacDiarmid Duck and Cover (foreground). Polystyrene, wood. Bent Over (background). Brass, thread. Various dimensions. Kate Palmer Riding Switch 3 (detail). Acrylic and mixed media on canvas. Original dimensions 114 x 242cm.